In a busy world with many demands, stressors and hectic schedules, more and more people are seeking relaxation and restoration that is not always easy to find. Amethyst crystal BioMat therapy provides a simple and soothing answer to overwhelmed minds and aching bodies – health and healing in just a few minutes a day. Amethyst crystal BioMat infrared therapy provides a simple and soothing answer to overwhelmed minds and aching bodies – health and healing in just a few minutes a day. Used as part of the amazing energetic technology that comprises the BioMat, a mat that offers heat therapy and more to restore and heal the body, amethyst crystal therapy has been celebrated for centuries by both scientists and healers. As a superconductor, amethyst helps to deliver Infrared Light waves and balancing Negative Ion Therapy, which can help alleviate everything from depression to insomnia, from inflammation to anxiety, and from low energy to body aches and pains. Amethyst is a crystal that belongs to the quartz family and has been recognized for its ability to boost the immune system, circulatory system and metabolism, reduce headaches, soothe the nervous system, and provide a sense of balance and wellness for many years. It has been used to treat everything from toothaches to arthritis – and some people even claim that crystal amethyst therapy increases their intuition and psychic powers. Amethyst crystal treatments are now being used by mainstream doctors and scientists who recognize its’ healing benefits and often recommend the BioMat and amethyst crystal therapy to their patients as part of overall wellness plans. In addition, amethyst also helps to carry far infrared rays, first studied by NASA for their ability to boost cardiovascular activity and vitality, which can help health and restore the body from within. Amethyst crystals actually elongate and amplify the natural wavelength of these far infrared rays, allowing them to penetrate up to 6 inches deep into the body. By comparison, other far infrared technologies may only penetrate 1 to 1.5 inches. Amethyst is often called “nature’s tranquilizer,” thanks to its overall calming and healing properties. Amethyst Healing and the BioMat infused with the healing properties of pure amethyst, the BioMat is safe and effective for both short- and long-term issues, and is available in two sizes, which both take advantage of the superconducting properties of pure amethyst therapy: the BioMat Professional for health care professionals and home use, and the BioMat Mini for people who want to try an amethyst crystal treatment at the office or while traveling. Both options, as well as more information and products, are available online at Perfect Ohm – Biomat.com. 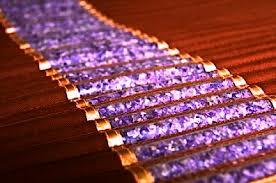 Even better, the healing effects of the BioMat take place while you rest – most people say they genuinely enjoy their time soaking up pure amethyst crystal, and you don’t have to do anything but choose the settings that work best for your body and lifestyle, then sit back, relax and let the crystal therapy work its magic! The BioMat is now used for sports injuries, post-surgical healing, joint paint, sleep issues and more and continues to grow in usage and popularity, thanks to the myriad benefits of crystal amethyst therapy. An ancient stone, amethyst can change your life with its amazing powers today! Perfect Ohm offers BioMat Therapy as a stand-alone treatment, or in conjunction with massage/acupuncture! Yes, I would like to receive emails from Perfect Ohm. Thank you for trusting us in your healthcare needs!